3D perspective of Decorah Impact StructureCourtesy Public domain via USGSBy studying magnetic and electrical data, geologists have found further evidence that the town of Decorah, Iowa is built upon an ancient impact crater created around 460 million years ago. Site map of Decorah craterCourtesy Vkil via Wikipedia Creative CommonsDecorah is located in northeast Iowa near the Minnesota border about 150 miles south of Minneapolis. Scientists think the Decorah Impact Structure resulted from the same meteorite barrage - known as the Ordovician meteor event - that produced similarly-aged craters found in Oklahoma, Wisconsin, and the Slate Islands in Lake Superior. 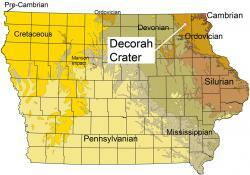 The Decorah crater lines up nicely with the others. 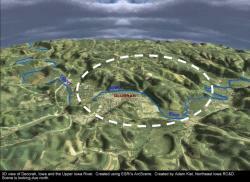 The first evidence that an ancient crater might exist under Decorah came in 2008 when well-drilling cores from the area collected and examined by Iowa's Department of Natural Resources and Geological and Water Survey indicated that a wide-ranging layer of an unusual type of shale set beneath the surface and encircled the town. Recent aerial geophysical measurements (both gravity and electrical magnetic) by the US Geological Survey and other agencies, including the Minnesota Geological Survey, affirmed the crater's existence. The unusual shale layer is situated 50 feet under the bed of the Upper Iowa river and was probably deposited after the crater's creation when an ancient seaway invaded the area and filled in the basin with mud and sediment. Shocked quartz found in the rock layer directly beneath the shale adds further evidence that some sort of major impact took place. Shocked quartz is a highly stressed and shattered quartz produced only one of two ways: either by a bolide impact or from a nuclear blast. The impact that created the Decorah structure is estimated to have released the energy equal to the blast of 100 megatons of TNT. To put things in perspective, the nuclear bomb dropped on Hiroshima during World War II was equal to 15 kilotons of TNT. One megaton equals 1000 kilotons so the bolide blast in Decorah would have released the energy of more than 6500 Hiroshima bombs! Paleobiologist Bevan French, an adjunct professor at the Smithsonian Institution's National Museum of Natural History studied quartz samples from the underlying layer of breccia and concluded they held characteristics indicative of an extra-terrestrial impact event. When it slammed into Earth, the Decorah impactor created a 3.5 mile-in-diameter crater in the planet's surface and shattered existing layers of Early Ordovician and Cambrian rocks pushing them deeper underground. Several other meteor craters discovered on earth date back to around the same time period 450 to 470 million years ago, causing French to wonder if the Decorah crater should be included in that spike in impact frequency. According to French the shale above the breccia layer is very well preserved and contains "a very fascinating biological assemblage,"which could also be of interest to paleontologists. "Finding structures like these and being able to study them in the geological context," French said, "is going to yield a lot of very fascinating information about the relations between the terrestrial system and the extraterrestrial influences." Sign of demise and new beginnings: A distinct layer of white clay in southern Colorado rock exposure (and found elsewhere around the world) marks the end of the dinosaurs (non-avian, anyway) and the beginnings of the reign of mammals.Courtesy Mark RyanHas past life on Earth been influenced by these impacts? If you consider the Chicxulub impact crater in the Yucatán Peninsula of Mexico and its alleged effect on non-avian dinosaurs at the end of the Cretaceous Period, you have to wonder if similar impact events weren't responsible for other extinctions and biological radiations during Earth's long history. Mount Etna, located on the Italian island of Sicily, has been very active lately, as seen in this spectacular video by Boris Behncke, a researcher with Italy's National Institute of Geophysics and Volcanology. 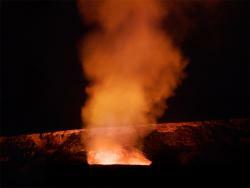 The stratovolcano is formed along the northern boundary of the African Plate as it collides with the Eurasian Plate. The shots of the exploding lava bubbles are fantastic and are reminiscent of a Fourth of July fireworks display. The images with the setting Moon are serenely beautiful. Etna is also blowing some great smoke rings! In other volcano news, the rumblings of a new volcano have been detected under a half-mile thick sheet of ice in West Antarctica. Using seismograph data gathered from several field sites across Antarctica researchers - led by Prof. Doug Weins and PhD student Amanda Lough of Washington University in St. Louis, Missouri - think the volcano could be the newest in a chain of volcanos migrating under the ice-covered continent. Radar images gathered by researchers from the University of Texas have confirmed volcanic ash encased in the ice near the source of the detected activity. The seismic rumblings originate somewhere between 6 and 9 miles beneath the bedrock surface, too deep to be caused by sub-surface glacial movement or even tectonic activity. 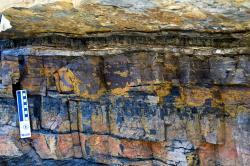 The study appears in the advanced online issue of Nature Geoscience. For a long time, scientists have known a major volcano complex was under the Pacific Ocean off the coast of Japan. But upon further inspection, they've discovered it's one huge volcano, measuring 280 miles by 400 miles across. You can read more about this huge discovery right here. The massive tornado that tore through Moore, Oklahoma today is estimated to have been between 1 to 2 miles wide (!) and stayed on the ground for about 40 minutes. As of this writing it's been designated as an EF4 category storm, but that could change. The damage is hugely extensive and the total loss of life and property won't be determined for a several days to come as workers dig through the rubble and debris. The above time-lapse video shows how the twister started fairly small then quickly grew into a super-destructive force of nature with wind speeds estimated - so far - to have been upwards to 200 miles per hour. 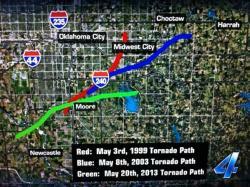 The same region around Oklahoma City was ravaged by an EF5 tornado back in May of 1999. A local meteorologist called today's tornado "the worst tornado in the history of the world." The devastation seen in the aftermath of today's monster tornado lends some credence to that statement but time will tell. 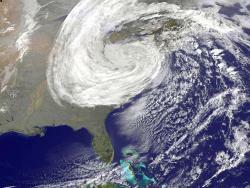 Go to Smithsonian.com to put this deadly storm in perspective. If a storm stays out at sea, does it matter? One of the biggest weather events in years has been going on in relative anonymity over the past few days. Cyclone Felleng has been churning over the open waters of the Indian Ocean generating winds of up to 100 mph. Click here to learn more and see some dramatic satellite images of Felleng.